While the Arab uprisings have overturned the idea of Arab "exceptionalism," or the acceptance of authoritarianism, better analysis of authoritarianism’s resilience in pre- and post-uprising scenarios is still needed. Modern Middle East Authoritarianism: Roots, Ramifications, and Crisis undertakes this task by addressing not only the mechanisms that allowed Middle Eastern regimes to survive and adapt for decades, but also the obstacles that certain countries face in their current transition to democracy. This volume analyzes the role of ruling elites, Islamists, and others, as well as variables such as bureaucracy, patronage, the strength of security apparatuses, and ideological legitimacy to ascertain regimes’ life expectancies and these factors’ post-uprisings repercussions. Discussing not only the paradigms through which the region has been analyzed, but also providing in-depth case studies of Tunisia, Egypt, Libya, Algeria, Saudi Arabia, Iraq, and Iran, the authors arrive at critical conclusions about dictatorship and possibilities for its transformation. 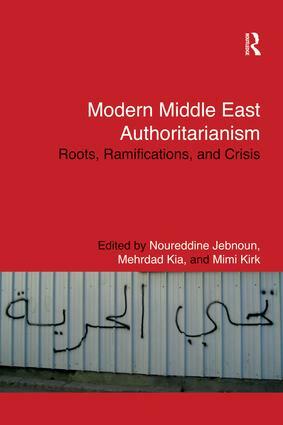 Employing diverse research methods, including interviews, participant observation, and theoretical discussions of authoritarianism and political transition, this book is essential reading for scholars of Middle East Studies, Islamic Studies and those with an interest in the governance and politics of the Middle East. Bumpy Democratic Routes to Dictatorial Ends? Constitutional and Ideological Barriers to Reform in Iran: Is Change Possible Within the Existing System?